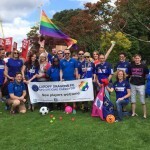 During their campaign to promote the upcoming Football v Homophobia tournament, Cardiff Dragons FC have scored a winner by linking in with Sport Wales, the Football Association of Wales and the Welsh Football Trust. All three national bodies of sport have actively promoted the tournament on their websites, Facebook pages and Twitter feeds, helping to raise the profile of the event, and in turn, the activities of the club too. Places are still open for teams so for further information about the event and a tournament entry form, contact the Club Secretary (secretary@cardiffdragonsfc.co.uk).